The Georgia Bulldogs answered the bell in another top-10 matchup, doubling up the Wildcats 34-17. The game shouldn’t have been that close, with 2 bad-snaps turning into turnovers, inside the Kentucky 30. Georgia was clearly the better team from the jump. Jake Fromm was his usual efficient self, completing 70% of his passes, but Georgia really leaned on the run is this one. Holyfield and Swift both went over 100 for the game and had 3 scores between them. By no means has the Georgia offense been bad this year. The Dawgs have scored at least 34 points in every game outside of LSU. But a healthy D’Andre Swift is just… different. Runs that might break for 15-20 yards turn into touchdowns with Swift. He showed his elusiveness against Kentucky, slicing past three wildcats on his way to a 20 yard score. Swift had a career day in Lexington, rushing for 156 yards on 16 carries, including 2 touchdowns. Elijah Holyfield is an excellent back, but Swift has a chance to score every time he touches the ball. When Kirby Smart started filling out his coaching staff in Athens, he started with coordinators Jim Chaney and Mel Tucker. But the biggest get was snagging offensive line coach Sam Pittman from Arkansas. Pittman has earned his keep this year. 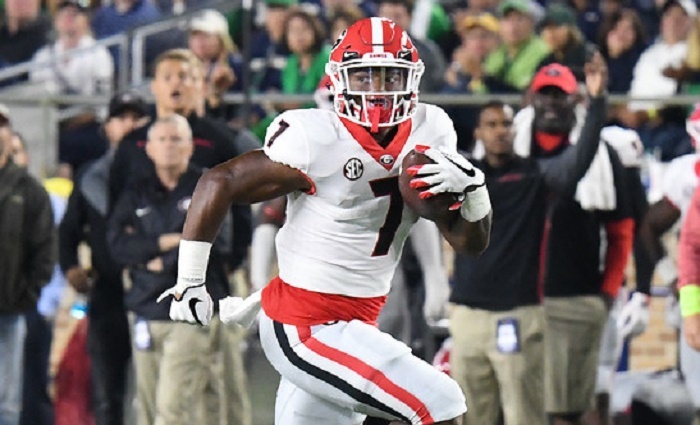 It’s easy to forget that as recently as the beginning of last season, Georgia’s line was a major point of concern. Now it’s an unquestioned strength. Even through multiple starters going down, Pittman has had this line punishing opposing teams. It all starts with recruiting, which Pittman has excelled at. Georgia’s sideline is now littered with 4 and 5 star lineman. When this group is healthy, they’re perhaps the deepest in the country. Even when they’re banged up, they’re still one of the most talented and well coached. For the first time since 2011-2012, Georgia is headed to back-to-back SEC Championship games. The Dawgs will almost certainly be ranked in the top-5 after this week, and are starting to catch fire at the right time. The young guys, who lacked experience at the beginning of the year, are starting to make a huge impact. This is why he was hired at Georgia, to consistently have the Bulldogs competing for conference and national titles. Now he just has to make sure the team is focused on a good Auburn team coming to Athens.